B' e fiosaigiche à Sasainn a bha ann an Stephen Hawking. Rugadh e ann an Oxford 8 am Faoilleach 1942 - 14 am Màrt 2018 was thogadh e ann an St Albans. Dh'ionnsaich e fiosaigs aig Colaiste an Oilthigh, Oilthigh Oxford. Ged a ghabh e tinneas motor neurone sna 1960an, is ro-innis na lighichean nach mairidh e corr is dà bliadhna, sgrìobh e an tràchdas aige fo Dennis Sciama aig Oilthigh Chambridge, far an do mhair e mar neach-teagaisg, rannsaiche is àrd-ollamh, le chathair-chuibhle, nursaichean is sinteisear labhairt. Tha e as ainmeile airson na h-obrach aige air tuill-dhubha, ach sgrìobh e cuideachd leabhar saidheans fèillmhor, A Brief History of Time sna 80an is rinneadh am film The Theory of Everything ann an 2014 mu a dheidhinn. Chaochail e 14 am Màrt 2018. Bhuannaich e an Duais Albert Einstein (1978), an Duais Wolf (1988) is am Bonn Copley ann an 2006. ↑ Penrose, Roger: “Stephen Hawking - obituary by Roger Penrose”, The Guardian. 14mh dhen Mhàrt 2018. Air a thogail 14mh dhen Mhàrt 2018. 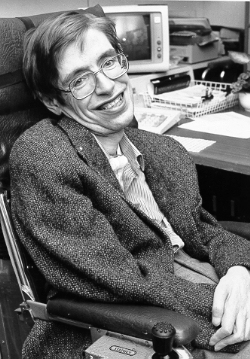 ↑ “Professor Stephen Hawking, ScD, CH, CBE, FRS”. Colaiste Gonville is Caius, Oilthigh Chambridge. Air a thogail 14mh dhen Mhàrt 2018. Air a tharraing à "https://gd.wikipedia.org/w/index.php?title=Stephen_Hawking&oldid=541441"
Chaidh an duilleag seo a dheasachadh 23 dhen Mhàrt 2018 aig 07:43 turas mu dheireadh.